A housing association in Cornwall has become the first in the country to install alternative geothermal heating for its tenants. 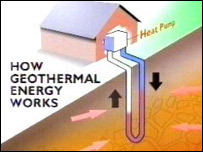 The system uses natural heat found just below the surface of the earth. Penwith Housing Association has installed the heating units in the village of Ludgvan, near Penzance, which has no mains gas. The installation which cost £8,500 for each of the 14 homes, has been subsidised by the government. Villager Linden Jones, whose home was previously heated by an open coal fire, says he is delighted with the new geothermal system. Mr Jones said: "You switch it on and it's warm in an hour. "At least we haven't got the coal dust and ash and I don't have to get down on my hands and knees to clean the fire out." Geothermal heating works by absorbing heat from the earth, which maintains a nearly constant temperature of between 10C to 16C (50F to 60F). Cool water is circulated through a heat pump and moves through the underground pipe where it absorbs the heat. It then flows back to a pump which extracts heat from the warm water. In winter the pump removes heat from the exchanger and pumps it inside the homes. But in the summer, the process is reversed, and the heat pump moves heat from the indoor air into the heat exchanger. The heat removed from the indoor air during the summer can also be used to heat water, providing a free source of hot water. Denys Stephens from Penwith House Association believes the technology has great potential. He says it will help provide affordable heating where no mains gas is available. Mr Stephens added: "The other great thing about geothermal energy is it produces very little carbon emissions, so it's very good for the environment." The Department for Trade and Industry is closely monitoring the scheme.